They say a mother's instinct is a powerful thing. I knew better than to ignore it. At 16 weeks, Puff and I decided it was time for Bimmer to cry it out. Doc Hottie had recommended it 8 weeks earlier, but I just didn't have the heart. But with me starting back to work, Puff and I needed as much rest as we could get. It was time for Bimmer to understand she could last the night without Mommy and Daddy next to her. It was the worst parenting mistake we have made yet. 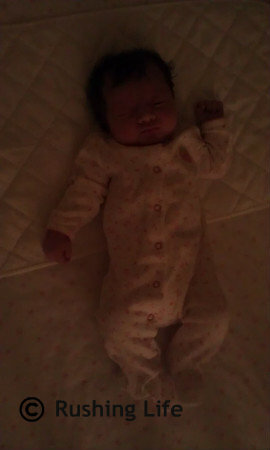 The first night, she cried for 30 minutes and slept for 45. Then she cried for 15 minutes and slept for 3 hours. But then? Then we had over an hour and a half of screaming. When she finally got herself back to sleep, it lasted all of 45 minutes. By that time it was 5am and I went to rescue her. She went back to sleep so soundly with me for 4 more hours. The next few nights were more of the same. The crying didn't tug at my heart, like everyone said it would. It just frustrated me because I couldn't sleep through it! Eventually we hit a night where she was up for over 2 hours and kept getting herself stuck sideways, ramming her head into the side of the crib. 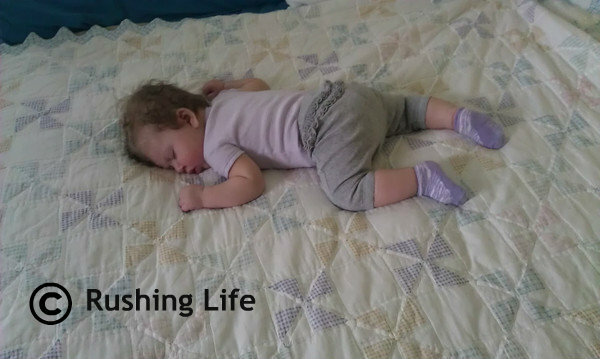 Or the time she rolled on to her stomach and stayed face down in the mattress. The worst was the time she got herself wedged into the corner, face down, with her arm stuck through one of the crib slats. The final straw came after a week of sleepless nights and no progress, when over a 10 minute span, she rolled herself over twice to get stuck on her stomach and the third time, she got herself stuck on her side with her face in the side of the crib. This was not teaching her how to sleep through the night. This was teaching her to mistrust her instincts. It was scaring her. I know ultimately, we will have to try it again. But this just wasn't the right time. From the get go, Bimmer has been very independent and cannot be forced into doing anything she doesn't want to do. With me starting back to work, maybe it was just too much major change all at once. 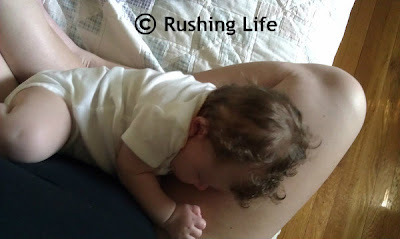 And like I mentioned HERE, not all babies are the same. Just because most babies can be comforted by their parent just patting them on the back while in their crib, doesn't mean Bimmer is cool with that. In fact, the nights we tried to calm her without picking her up? That made it infinitely worse. She's a smart baby. She knows if we are there, we should have the ability to pick her up to make her feel better. 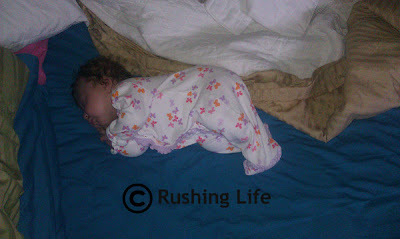 We will try again when she can safely roll herself over both directions. Puff jokingly asked me the other day if he was still the only one for me. I had to admit that I have been sleeping with someone else. She's 2 feet tall, has curly light brown hair, and the biggest, bluest eyes. And I will sleep with her for as long as she needs me. The first morning after we abandonded Operation CIO? I awoke to find Bimmer next to me in the bed, on her side facing me, snuggled up as close as she could get herself, and she had her little arms wrapped around mine, holding it close to her chest. It was awesome to not have her crying. Instead, there were happy tears from Mommy. I think this means she forgives me.